What makes garlic so healthy? Allison … wait. No. Allicin! When fresh garlic is chopped or crushed, the enzyme alliinase converts alliin into allicin, which is responsible for the aroma of fresh garlic. (You can think of it reacting like a two-part epoxy.) The allicin generated is unstable and quickly changes into a series of other sulfur-containing compounds. 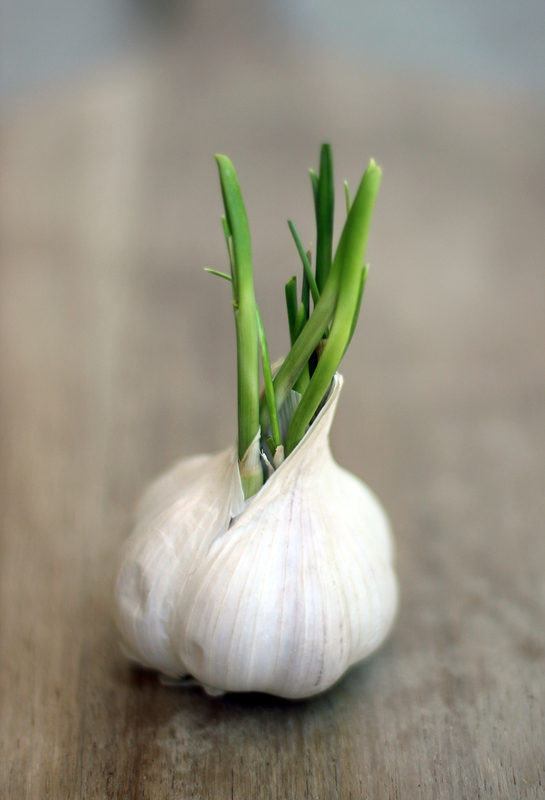 Allicin is part of a defense mechanism against attacks by pests on the garlic plant. It also has a huge number of health benefits. The last few weeks we have looked at crops you can easily grow indoors during the winter. Garlic is no different. Although, we won’t be growing a bulb, but rather garlic shoots. Just think of this as a combination of growing sprouts and growing the paperwhites I shared in previous blog posts. Garlic shoots can be cut up and used similar to how you would use green onions. They have a taste that is generally milder than the garlic bulb. They make a great addition to stir fry and soups. Like growing paperwhites, perhaps the simplest method is to just root them in water. However, they can also be planted in potting soil too. Once planted, place them in a sunny windowsill. You should start to see signs of life in a week or two. Similar to paperwhites, you want to just keep the bottom of the bulb wet to prevent rotting. Also, change the water regularly if going the soilless route. Now for one of the age-old debates when it comes to growing garlic shoots – to separate or not. Some people break apart the bulb into individual bulbs before growing and others do not. If you grow them as individual cloves, you’ll get single shoots as opposed to a bundle of shoots is you leave the bulb intact. Normally, if you were planting these outdoors, you would definitely separate the cloves. However, these will be discarded after the shoots are harvested. I think it comes down to personal preference and the space you have available for rooting the shoots. It’s as easy as that! Later this spring we’ll take a look at growing fresh garlic outside and how to harvest it. Until then, this method is a great way to add some fresh, green goodness to your meals.